The tiger population in Bhutan has showed steady increase over the last few years. New tiger photographs and pugmarks that were found from different parts of the tiny Himalayan kingdom indicate an overall increase in their numbers. In an encouraging note, the number of tigers has doubled from 10 to 22 at the Royal Manas National Park, one of Bhutan’s oldest parks located in south central Bhutan, between 2010 and 2016, according to reports. A total of 90 camera stations, each with two cameras were installed across 1,300 square kilometers in Manas. According to latest data analysis, the number had increased to 28 tigers in the park by 2018, based on the same camera surveillance that had been used for earlier surveys. Though it is difficult to ascertain as to how many have increased through migration and how many from new births, conservators put it fifty-fifty. 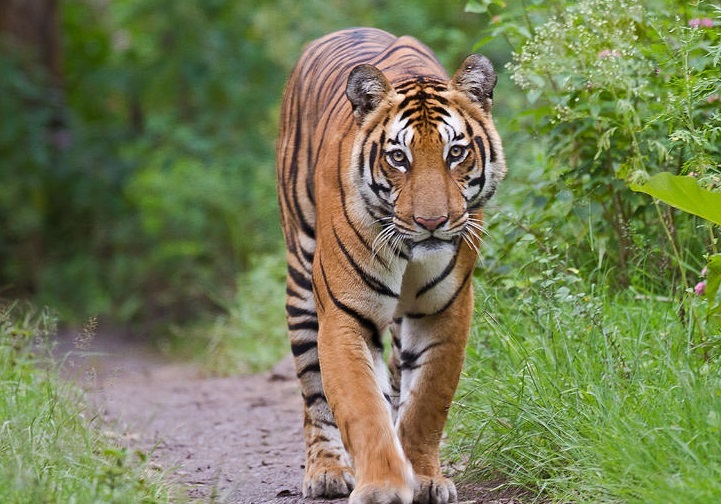 According to the World Wildlife Fund (WWF) Bhutan, 12 trans-boundary tigers have been recorded in the Transboundary Manas Conservation Area in 2015, an increase from just four tigers in 2011, according to the latest report on tigers of Transboundary Manas Area. Bhutan conducted its national tiger survey in 2014-15, which estimated 103 tigers. With the latest increase in their population, Bhutan is all set to project doubling of tiger population by 2022. According to experts, well coordinated trans-boundary cooperation with India, anti-poaching measures, habitat conservation and awareness among farmers has led to the increase in the tiger population in the kingdom, along with the successful implementation of the Tiger Action Plan. Another big initiative for the conservation of tigers in Bhutan was the establishment of the National Tiger Centre last year in the southern district of Gelephu, which borders India, with its primary focus on the conservation of the iconic species. One of the big advantages for Bhutan is habitat. Bhutan’s constitution mandates a minimum of 60 per cent forest cover. Bhutan had forest cover of 71 per cent in 2017 while 51 per cent of the country’s land is a mix of protected areas and biological corridors.